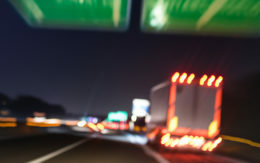 Traffic deaths from speeding have risen following the 1995 repeal of the federal 55 mph speed limit, according to the Insurance Institute for Highway Safety. Written by Adrian Lund, president of the Insurance Institute for Highway Safety. This is one in a series of periodic guest columns by industry thought leaders. Few things carry more potential risk than a semi-trailer barreling down the highway at 80 mph. The federal government’s plan to require speed limiters on large trucks that would hold their speeds to a set level — probably 68 mph or lower — is a logical step that would improve safety. Extreme speeds have become commonplace as state legislatures around the country have set higher and higher limits. These higher speeds are more dangerous the heavier the vehicle. Large trucks have longer stopping distances than other vehicles, making it more difficult for them to avoid a crash. When a crash does occur, speed and vehicle weight determine the energy involved and therefore the severity of the collision. Even a lightly loaded 40,000-pound truck has 13 times the energy of a 3,000-pound car traveling the same speed. Although the danger of high speeds is compounded for large trucks, the trend of continually raising limits has consequences for all road users. Our research at the Insurance Institute for Highway Safety has found that 33,000 deaths between 1993 and 2013 can be attributed to speed limit increases. The annual toll from speed limit increases largely cancels out the number of lives saved every year by frontal air bags. State legislatures set the maximum speed limit in each state, and since 1995 they have been allowing higher and higher limits. The beginning of that trend followed the unraveling of the national maximum speed limit, a federal law that required states to adopt 55 mph as their maximum speed limit in order to receive their share of highway funds. Concerns over fuel availability had prompted Congress to adopt the measure in 1973, but another benefit was a decrease in crash deaths of 4,000 in the first year alone. As energy concerns faded, Congress relaxed the restriction in 1987, allowing states to adopt limits of up to 65 mph on rural interstates. A complete repeal came in 1995. Since then, states have been adopting higher and higher limits. Today, 41 states have limits of 70 mph or higher on some roads. That includes six states with 80 mph and one — Texas — where drivers on some roads can travel 85 mph. Despite the deadly consequences of extreme speeds, the idea of lowering limits for all vehicles hasn’t gained traction in legislatures. Given this reality, we welcome the proposal by the Federal Motor Carrier Administration and the National Highway Traffic Safety Administration to at least put a cap on the speeds of the biggest vehicles. Some critics of the proposed rule have raised concerns about different vehicles on the same road traveling at different speeds. But most trucks already travel at lower speeds on average than passenger vehicles. That’s in part because many companies voluntarily use speed limiters to improve safety and fuel economy. In addition, seven states have lower maximum speed limits for trucks than for passenger vehicles. However, a small number of trucks do travel at very high speeds, putting their drivers and the people in vehicles around them at grave risk. We recently studied the effect of raising speed limits from 75 to 80 mph for all vehicles on certain road segments in Utah. We found that the proportion of large trucks exceeding 80 mph rose from 0.1 percent to 2.3 percent. While still a small number, every truck traveling that fast represents a big risk because it has 50 percent more energy to manage in an emergency situation than if it were traveling 15 mph slower. Speed limiters that physically prevent trucks from traveling that fast are one way to make roads safer for everyone. Editor’s note: Adrian Lund is president of the Insurance Institute for Highway Safety and the affiliated Highway Loss Data Institute. He joined the Institute in 1981 as a behavioral scientist. This is nonsense. The IIHS supports the lowest possible legal speeds so there will be more speed traps. Then their member insurance companies can surcharge the premiums of mostly safe drivers caught in the speed traps for more profits. The 33,000 number quoted in their “research” is NOT genuine peer-reviewed academic research. It is the result of some cherry-picked subsets of data then used with some assumptions to come up with a number that is in no way supportable with real research. And the majority of comments on the federal proposal for truck speed limiters were negative, because limiters would reduce safety for all road users. NO ONE should support limiters. On a restricted course where all vehicles are traveling in the same direction the most efficient means of reducing collisions is to reduce interactions. The most efficient means of reducing interactions is for all objects to traveling at the same speed with total freedom of movement. When you add the 3 national studies that revealed an extremely lopsided responsibility for fatal collisions involving cars and trucks being held by cars this reality, the reality of the laws of physics and the fact that this piece is yet one more that focuses on only one factor out of many, the faulty reasoning of the belief in this piece is shown to have little merit. Of course speed is a factor. It is as much if not more of a factor during the course of traffic flow before it becomes a factor in traffic flow stopping. I have difficulty with anyone with the education of this author that picks and chooses specific and limited variables while denying or ignoring numerous others to make a point that is proven false by already exist at and undeniable facts. I think we need to set Mr Lund’s vehicle for 60 mph. If its so much safer for trucks to be held at slower speeds, wouldn’t it apply to all vehicles.Because according to your insurance industry studies as well, the majority of Truck vs auto accidents are caused by the auto. Thank you Mr. Lund for at least trying to teach people why and how by using common sense, proving your arguments using simple laws of physics that everyone should be able to understand as well as supporting it with scientific research. As noted, this is an opinion. And, it is an opinion from someone who does not drive a truck for a living. If this person were to be limited to 50 mph, would he/she be safer? Probably. So, why not limit him/her to 50 mph? Let’s limit all vehicles to 50 mph and see how the public likes it. Freedom has responsibility, but freedom and liberty should not be sacrificed to make others feel more comfortable. Those who would exchange freedom for safety deserve neither. I think Ben Franklin said that. Anytime you want to see how ludicrous your ideas are, you let me know and I will take you along with me in my truck for a week. That should be plenty of time for you to see why speed limiting ALL trucks is a very bad idea. If you want to impose lower speed limits for ALL vehicles, go for it, but only limiting trucks will cause MORE, not fewer accidents. Speed limiters will solve nothing! Proper driver education and training of a longer duration with a minimum 6 months of supervised behind the wheel experience might help. And I emphasize might! The trainer needs to have, in my opinion, a minimum of 5 years violation free experience behind the wheel themselves, not 2 days more than the individual they are training! The mega-carriers with their self funded schools and ability to self insure, are guilty of flooding the nations highways with some of the most dangerous drivers I have ever seen. And yet they are allowed to continue status quo. They think by mandating elogs and speed limiters they will solve the problem through micro management. Truth is, ya’ just can’t fix stupid! Well, the speed limitation is a good idea, but the truckers must have an opportunity to move a bit faster for a short period of time. Sure the rates for the loads must increase a bit to compensate additional time spent in the truck. And BTW the backhaul finding services must work smarter. All these Apps like Convoy or Doft.com, so called Uber for trucking, must offer the truck driver a backhaul as close as possible to their destination point.